Authored by cullmann on May 2 2018, 1:27 PM. the text. The layout of the line is adapted to create space for the note. side or rendering square with color preview next to CSS color property. This is my first attempt to propose such API, it may not be ideal. If the inline note is placed into text, the space for it is created using QTextCharFormat's absolute spacing between the two letters. I admit it is quite a misuse, but it was the least intrusive way to create the space. Everything else seems to work with it out of the box without further modifications. You can find screenshots in the "samples" directory. Awesome idea! Do you have a screenshot of how it looks? 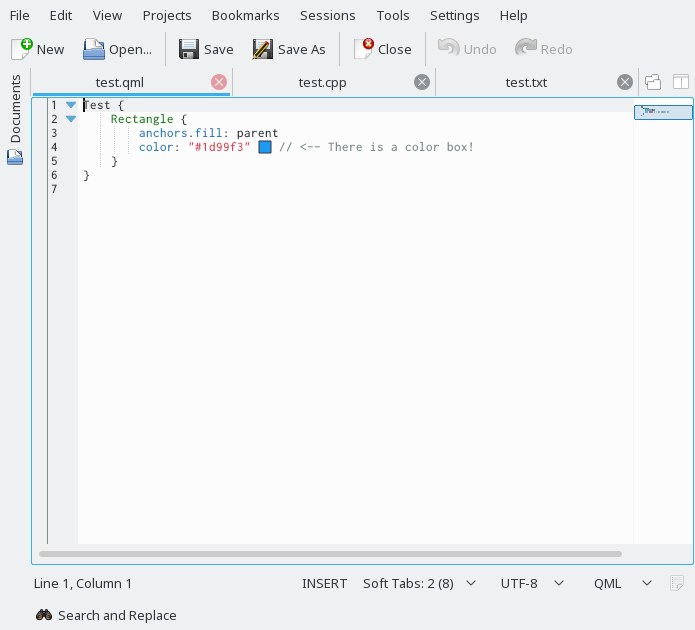 The plugin provides notes that are just hardcoded for those specific files. The style of the notes is completely up to the user of the interface. Looks good from the implementation too so far. One thing I do not see is any changes to the cursorToX / xToCursor functions, is there really no change required there? is selection rendered correctly if it includes notes, at the end, beginning, or middle of lines, also mult-line selections? what happens when clicking or dragging from or into the notes? does it still work properly with dynamic word-wrap on? does it work properly with code-folding? what happens if a note is at the border of a folding region? 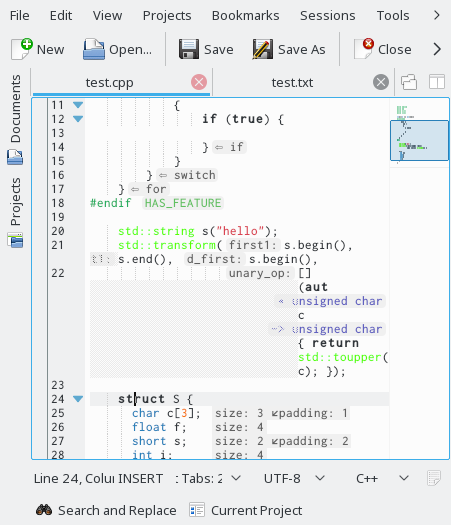 This gives compile-time argument type checking. No change was really needed. As the spaces are created when laying out the line, either by offsetting the start of the line or by formatting the text, it gets stored in the layout and the cursorToX / xToCursor work as expected. Even moving the cursor around with arrow keys works nicely (the cursor moves to the closest position above/below even if one of the lines is shifted). I can't tell whether it is good or bad behavior. Do you think it should stay this way - selecting the block of the real text, or should it instead select a "visual" block? 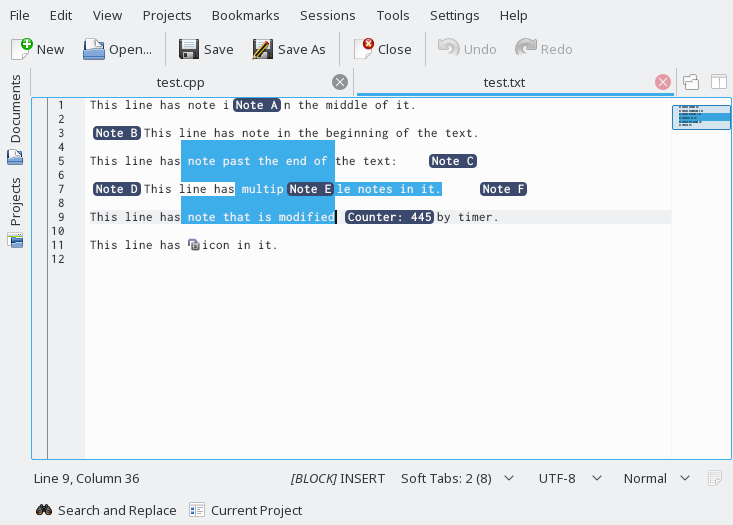 I was thinking it would be best to avoid this problem and hide the notes when doing block mode selection, but should that be done by ktexteditor directly, or by the user of the interface? I also imagine that anything that uses it would provide some quick on/off toggle for cases like this. Clicking into the note always places the text cursor on the right side of the note - in other words, the note acts as extension of the letter on its left. Dragging makes normal selection from that position. It works fine. When a line is hidden, so are the notes in it. One more thing that needs to be decided: At this moment if a note is placed past the end of the text too far to the right and word-wrap is on, it does not wrap, but renders partially or completely out of view. (This happens kinda by default as the layout of the line is not modified for notes out of the text.) My thinking was that it does not matter as one would either place notes in the text, or outside at a column that will be visible without scrolling/wrapping. But if you think it should wrap, I can try to find a way to make that happen. Thank you for the review, I'll fix these problems and make the changes you noted. I think fixing the selection rendering issue would be nice. Regarding blockmode behaviour, I think it will be a bit strange either way. One thing to compare is the behaviour with non-fixed width fonts: there block mode also selects constant columns (i.e. it will look ragged). This is probably closest to what you want when you use block mode, so I think it should stay the way you have it now. I would not rely on the user of the interface placing his notes in a visible column. If e.g. 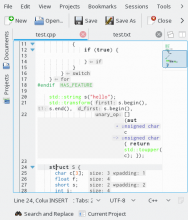 KDevelop would place some notes, and then the user resizes his window, and then they need to be re-placed by the interface user? That seems strange. Consider also that you can have a split view with two different widths for the same file and stuff like that. Oh, good point by the way: Are you sure this should be an interface to a *view*? Maybe it should instead be attached to the document? I'm not sure, I just want to bring the discussion up. 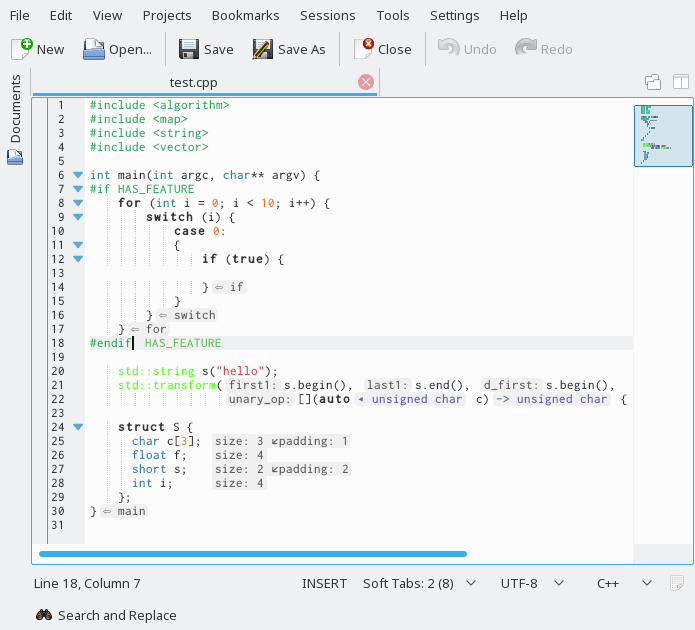 Actually, I think view might make sense, as you only mess with the layouts and renderer. But the implementation ATM makes it a interface of the document, or I am mistaken? Hm, maybe the question is less what is needed and more what it is supposed to do semantically. Does one add annotations to a *document*, or does one add them to a specific *view* of that document (considering that there can be more than one view of a document, even visible at once, e.g. splitview)? I think you can find arguments for both, but I feel like the document variant (as it is here) will be easier to handle. This is already an excellent patch. The API documentation is already really nice. I have some minor suggestions (see inline comments in patch). Besides that, I wonder whether this should really be a View extension interaface. 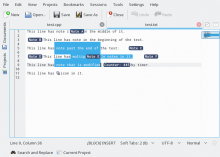 Currently, this interface is implemented by the KTextEditor::Document, while the API documentation mentions this interafce is a View extension interface. I would prefer a View extension interface. Could you provide an updated revision of this patch? And also: I think we have to discuss unit tests as well - since such kind of code will break otherwise when we have to change related code parts. Would be nice to have a discussion about this already now. This look like premature optimization. I would prefer to delete this "common cases first" block. Except if this turned out to be a bottleneck already? \image html inlinenotes.png "Inline note showing a CSS color"
\note A InlineNoteProvider instance can be reused/shared by multipe views, just make sure to unregister the provider from \e all views before deleting the provider. 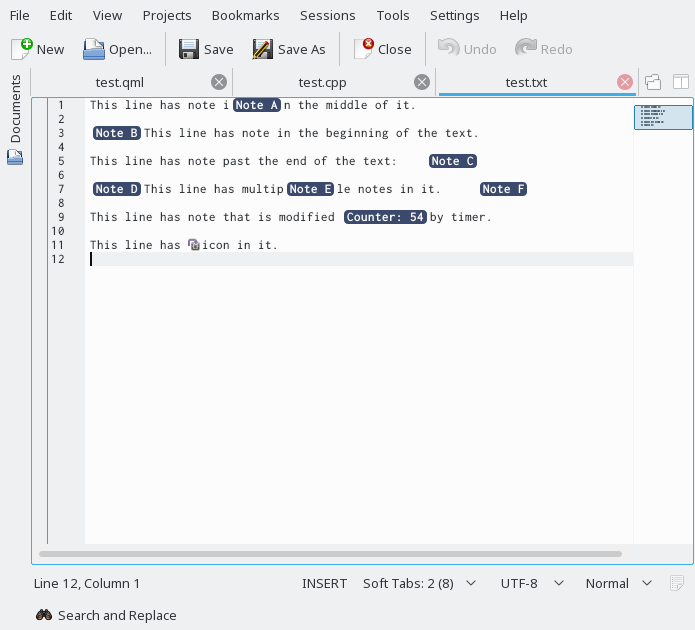 This way, a InlineNote contains not only the column, but ALL information (line + column) that defines the position of the note. Btw, may I am wrong here, since this is really called often when painting lines... So this may be good to have. I also stumbled upon it but it avoids an alloc in a very deep loop, so it might be worth it here. Anything anyone can assist with? We are currently at Akademy, KDE's annual conference, so we would have time to discuss any issues right now. Sorry, I had almost no time to work on it. I got stuck trying to figure out how to properly handle the notes at the beginning of the lines. The notes should use something like MovingCursor instead of fixed line + column, so they move when the text is edited, instead of waiting for refresh from the provider. Currently the notes are "glued" to the character on their left side - it is not possible to place cursor in between that letter and the note. It feels unnatural when editing. In other editors (e.g. 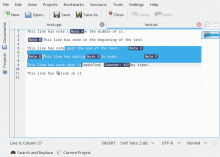 IntelliJ) the note behaves as separate character/object and the cursor can be placed on both sides. The note is still not editable, pressing backspace or delete just skips over the note. Any advice on how to achieve this with ktexteditor would be helpful. Wow, that looks amazing! Really impressive. cullmann added a reviewer: michalsrb. 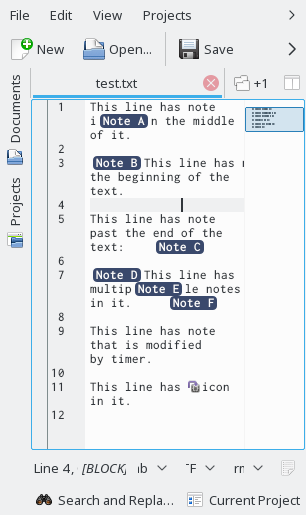 we will process further things of this request in Sven's copy D14826: inline note interface wip #2. 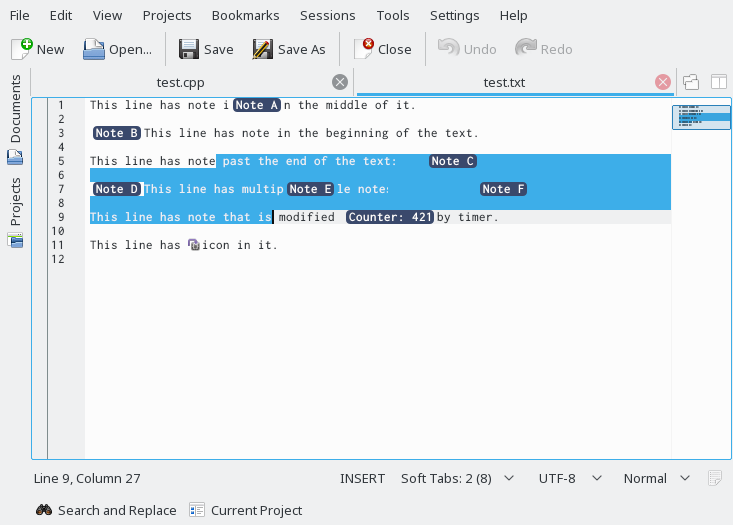 Head over to D14826: inline note interface wip #2. for the current state.